I returned to the robins’ nest I posted about last week on Monday afternoon to see that the four baby robins are growing amazingly fast! 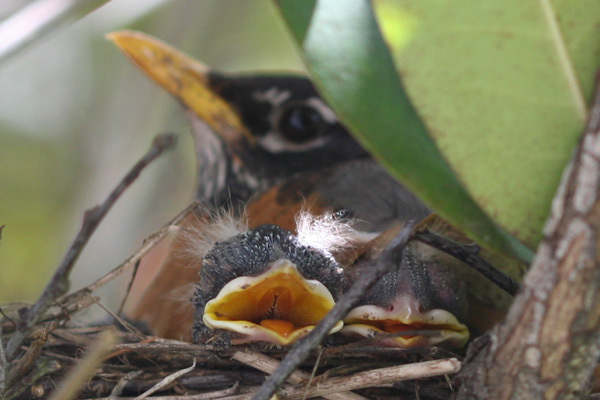 They have to grow fast, as they will leave the nest about two weeks after hatching. The nestlings here are about six days old. They also have to be big and strong. The one that gets higher and opens its mouth wider will get more food. This brood seems like they are all about the same size, which means the parents did a good job at ensuring that the eggs all hatched at about the same time. 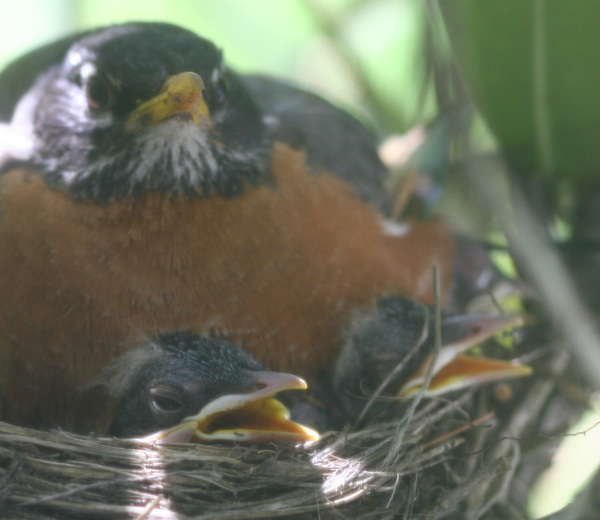 This is the view from outside, where I only took a couple shots, even though these robins have become acclimated to people near their nest. 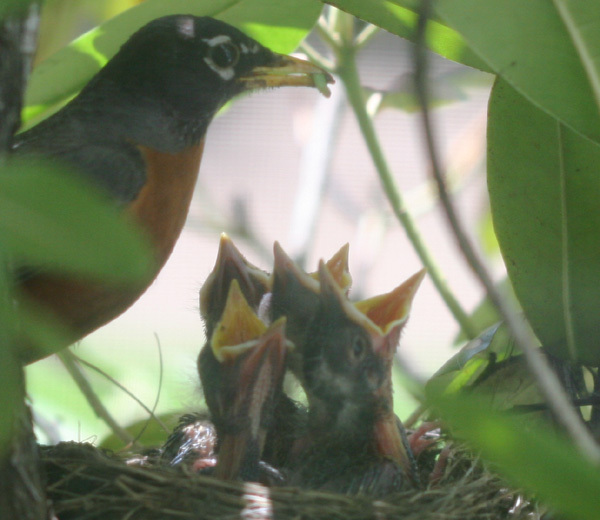 Such wonderful photos of your nesting robins! I love the last one with the little guy and the fuzz on its head! Corey, congrats on the offspring! I can totally see the family resemblance! @Marcella: Yes, I think they have my eyes…but they are much cuter. Do Kestrels (after leaving the nest) ever return to the nest? I have Kestrels in my chimney (I will have a barrier redone once they leave) and have had 5 babies drop in my fireplace, no fire. I have caught each one and realeased, all can fly and call for mom, just want to make sure that the same bird isn’t dropping in over and over. Dottie, I hope you got pictures! Kestrels usually lay from 4-6 eggs so I wouldn’t be surprised if you are getting different birds each time. I doubt an already fledged bird that has already experienced your chimney would be foolish enough to go back and do it again. Kestrels do tend to reuse nesting sites so please do make sure to get that barrier redone. What does a baby Phoebe bird look like? @Phoebe: They look like this. What is the National Bird of the United States?